I had a great time last weekend at the All Saints Bazaar. The vendors on either side of me (Alshiref and Jo Lupton) were both incredibly talented and equally nice. They gave me some good advice, helped me when my credit-card reader stopped working, and kept me company during a long day. I met some new customers, too. Adults who love to color stopped by and bought cards. A few others bought stationery for gifts. And one memorable visitor was a little boy who totally cracked up when he saw my mittened octopus card. That made my day! The card is supposed to be funny, and seeing a kid, maybe 5-years-old, get the joke was gratifying. So, off to Llewellyn this weekend. Then it’s the Lewis Holiday Bazaar and Tree Sale after Thanksgiving, Saturday, December 2 from 10am-3pm. Phew! I’ll have my hot-off-the-risograph-press cat poster and cards. They’re kitties with a message, designed to represent all types of people working together whether they love it or not (some cats are looking pretty grouchy), whether they agree with each other or not, and whether they look alike or not. 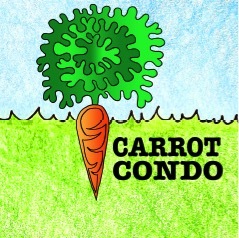 Carrot Condo will be at these three events–hope to see you there! Saturday, November 11 from 9am-4pm is the All Saints Holiday Bazaar at 3847 NE Glisan Street. Saturday, December 2 from 10am-3pm is Lewis Holiday Bazaar and Tree Sale at 4401 SW Evergreen.